Quick, name the Teacher of the Year for the United States from 2018. Okay, that’s hard. Name your State teacher of the year. Or your district teacher of the year. How about your local campus teacher of the year. My bet is that you probably have no idea. Over the years, I have attended many ceremonies that recognize the local teachers of the year from all of the districts in the area. There are the elementary and secondary teacher awarded from 12 different school districts. At the end of the night, two of them are award the Regional Teachers of the Year, given some love form local businesses, then go on to a state competition. You probably have attended events such as these in your life. They are more like beauty pageants than they are actual competitions. At the end, I almost always feel like breaking out into my best Bert Parks imitation…”There she is…Miss America…” almost. But I refrain myself. The whole “Teacher of the Year” (TOY) process got me thinking about the idea of what exactly is a “Teacher of the Year” in the first place. Campuses and districts spend lot of time and effort selecting teachers of the year, then a district teacher of the year, then a state teacher of the year, then finally a national teacher of the year. That is a whole lot of teachers. And for what? I understand and agree that teachers should be recognized, I really do. It is , in many cases, a crappy job in a lot of places and a lot of teachers are experts at making lemonade out of lemons. And for the most part, the teachers that win do indeed deserve the awards they get. But as I sit there and watch these pageants take place, I began to think that the entire exercise is a wasted opportunity to leverage the brainpower of those amazing teachers being recognized. Spotlight video: tell the teacher’s story. The beauty contest told the audience almost nothing about the backstory of each teacher. Why did they actually make it to the TOY finals? What was their story? What was their reason for becoming a teacher? Many of these teachers have inspirational stories. When I myself was being honored as a finalist, I remember being awed by my fellow honorees, telling their stories, from a teacher that once taught blind sharecropper’s children in the Mississippi swamps, to another that came to the US as a war refugee after World War II. Techniques video: Revisit each and every one of the TOY finalists and explore their classroom techniques. Almost every single one of them at the last ceremony I attended said something to the effect that they had made learning “fun.” What did that mean? How did they do that? Can that be replicated? Can they help teachers where learning in the classroom is not fun? Almost all can be seen using technology. How do they integrate tech in their classes? Mentor new teachers. Each TOY should be asked to mentor a new teacher. Let them share their knowledge and what they have learned with new teachers. Who better to learn from that from the best teachers in the area? Have media follow the TOYs around for a year, and allow them to become media spokespeople for a public book. This teacher is the YISD teacher we showcase as our best. Here is the EPISD best. Here is the Anthony ISD TOY. 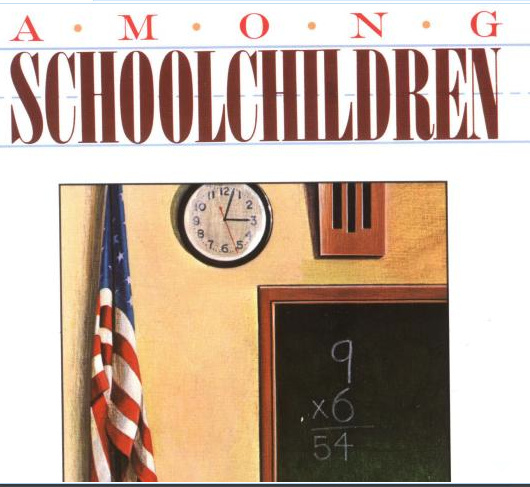 Document the lives of our TOYs: “Among Schoolchildren” by Tracy Kidder is a great example of the life in the year if a teacher. What if that could be expanded with district TOYs across the nation? What would an El Paso version of “Among Schoolchildren” look like? Can we create an online “recipe book” of all the TOYs so that their teaching knowledge lives longer than their momentary walk in the spotlight and acceptance speeches? The point is, I suppose, is that if someone is talented enough to be named a “Teacher of the Year” somewhere, there must be something that this person has that can be shared with other teachers. There must be some techniques, some passion, some wisdom that that teacher can share with others that is of value. My concern is that there are hundred if not thousands of “Teachers of the Year” across the US and that knowledge base is being squandered because they didn’t “win” the big prize. That is a lot of good information being wasted. How do individual campuses use the campus teacher of the year to help improve teaching and learning on the campus? How do individual districts use the campus teacher of the year to help improve teaching and learning in their districts? How does each state use their TOY to improve teaching and learning in their state? Look how it is done here. And while the National Teacher of the Year tours the nation giving inspirational messages, I don’t think that they do much more than that. I have never seen a national teacher of the year speak, and I have been in education for over 30 years. Have you? Each campus, each district should take the knowledge, the passion, the years of wisdom that each and every teacher of the year has and do something to share that with fellow teachers. Campuses should share with other campuses. Districts should share with other districts. States should share with other states. Use our Teachers of the Year wisely. Let them teach all of us.